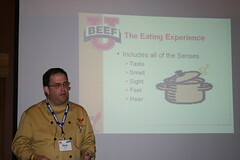 Dave Zino is the Executive Director of the NCBA Beef Culinary Center in Chicago. I had a chance to meet Dave at the Elanco Beef Consultants Forum 2009 in Banff earlier this month. Dave is a truly fascinating guy who has a real passion for how beef is cooked and trying to educate the public on how it should be cooked to truly enjoy the beef eating experience. Dave is an asset to the beef industry and I encourage you to watch the video below to get a better idea of the value the NCBA Culinary Center creates for the industry. I encourage you to check out BeefItsWhatForDinner.com to see some of the great work that Dave and his team do. For all of you Facebook lovers become a fan of the Beef Its Whats for Dinner Facebook Page as well. Europe is a world leader in the development of advanced renewable energy technologies. In the early summer of 2009, a delegation from Lethbridge, Alberta-based Trimark Engineering toured a biogas facility near Venice, Italy. The purpose of the visit was to investigate an advanced biogas technology suitable for applications in Canada. The process was developed by Austrian based ‘enbasys’, a company specialized in biotech energy. Markus Grasmug, Chief Technology Officer of ‘enbasys’ led the facility tour. The facility operates on the principles of composting and anaerobic digestion. Anaerobic digestion is a biochemical process where, in the absence of oxygen, bacteria decompose organic matter to produce biogas. The organic matter used as feedstock for the Venice facility consists of municipal solid waste and residues from food industries. The biogas is used as a fuel source for generators that feed power onto the utility grid. By-products of the process consist of compost and water. The facility is jointly owned by a private investor and the local municipality. It is located in a rural area, adjoining two villages. The operation receives organic waste by truck from a 150 km radius containing a population of 2.5 million. Approximately 400,000 tonne of waste is processed annually. Given the proximity of the facility to the nearby villages, odour control is critical. Buildings handling organic waste are tightly sealed. Ventilation air is exhausted through bio-filters. The bio-filters consist of wood and bark collected from the retention filters at the entrance of hydro power stations. The bio-filters were effective. In spite of the hot weather, during the visit no waste odours were detected outside of the processing facilities. The methane gas produced in the digesters is fed to three cogeneration units. The cogeneration units feed 4.0 to 4.5 megawatts of electricity to the utility grid. Waste heat from the cogeneration units is recovered and directed by a common pipeline to the hospital, school and a number of homes in the neighbouring villages. Mr. Grasmug indicated that the ‘enbasys’ technology is the culmination of over 10 years of research and development. This technology provides an efficient, compact, reliable, low maintenance process at a low operating cost compared to conventional technologies. The technology is capable of efficiently handling both varying volume streams and complex substrates with high chemical oxygen demand. The digesters at the Venice facility have operated continuously since the initial commissioning in 2005. The unique design of the digesters provides low retention times and no foaming issues. The digesters operate without the need for microbiological substrate additives, enzyme additives or pH adjustments. These characteristics enable the use of smaller, less costly vessels than other systems. The residue from the digesters is transferred to a centrifuge to separate the solid and liquid phases. The solids are composted for use as fertilizer. The liquid is treated in a membrane bioreactor to purify the water to potable quality. This water is recycled for process requirements including maintaining the bio-filter moisture level. Yearly, 140,000 tonnes of fertilizer and 80 million litres of clean water are produced from waste. Only 15% of the total input is land-filled. According to Grasmug, the capacity of the ‘enbasys’ system is easily sized for adaption to local availability and type of feedstocks. The design is scalable to installations as small as 10 kW. The effectiveness of the system for specific applications can be verified using the company’s portable demonstration plant. Beyond municipal waste applications, the technology is well suited to integration with processing operations. These include food and sugar beet processors, breweries, potato growers and other agriculture-based industries. A favourable business case may be made for system capacities of less than 500 kW. The ‘enbasys’ technology also provides the opportunity to address the disposal and pollution concerns associated with animal waste. Manure from livestock operations can be converted into useful energy and sterile fertilizer. The ‘enbasys’ technology will efficiently process cattle manure, which is normally a barrier to conventional technologies due to the high content of straw and sand. Trimark Engineering will coordinate trials of the “enbasys” technology in Canada. Federal and provincial government grant programs provide financial incentives for investment in alternate energy initiatives including biogas. These incentives will support the increased use of biogas technologies to reduce greenhouse gas emissions and address other environmental concerns. About the author: Erik Vandist is the Manager of Biofuels and Renewable Energy at Trimark Engineering. Based in Lethbridge, Alberta, Trimark Engineering specializes in process design for the industrial agricultural, food processing and renewable energy sectors. Currently the company is involved in a number of renewable energy projects including integrated biodiesel facilities. For further information regarding biogas technology, please contact Erik at erik@trimarkeng.com or (866) 328-2910. Its fall time and that means only one thing…… It’s harvest time. Harvest time is all about long hours, teamwork and lots of windshield time. To make sure that everyone is prepared I have embedded on of my harvest videos from YouTube which was produced by FarmallDiesel a farmer from Wisconsin. This video incorporates great song selection and a great plethora of video and still photos from the 2008 harvest. Amazingly this video has over 45,000 views. Enjoy the video and have a great harvest. Dr. Ross McKenzie, from the Lethbridge Research Station provides comments on the affect that modern farming has had on the soil. Some groups maintain that modern farming is destroying our top soil levels and creating adverse compaction, and decreasing organic matter. Others would say that things like organic matte are rising based on modern farming methods. I asked Ross to comment on this topic so that we could get a a professional scientific opinion to base some discussion on. When the canola canopy is thick and moisture is abundant applying fungicide is necessary. Matt Stanford of the Canola Council of Canada helps you go through the process of why or why not in terms of applying fungicide this season.